It’s official. I’m an old lady. There’s no doubt about it. And here’s the proof. I know that it’s been a while since I’ve published a blog post. The DH and I have been busy recently doing some super-serious spring cleaning which has been taking up a lot of my time. We are almost finished now; there are just a few odds and ends to finish up, but here is a recap of all the work we have done. We moved a lot of the furniture out of two bedrooms and emptied the closets, one of which is a fairly large walk-in, and painted both bedrooms and both closets. 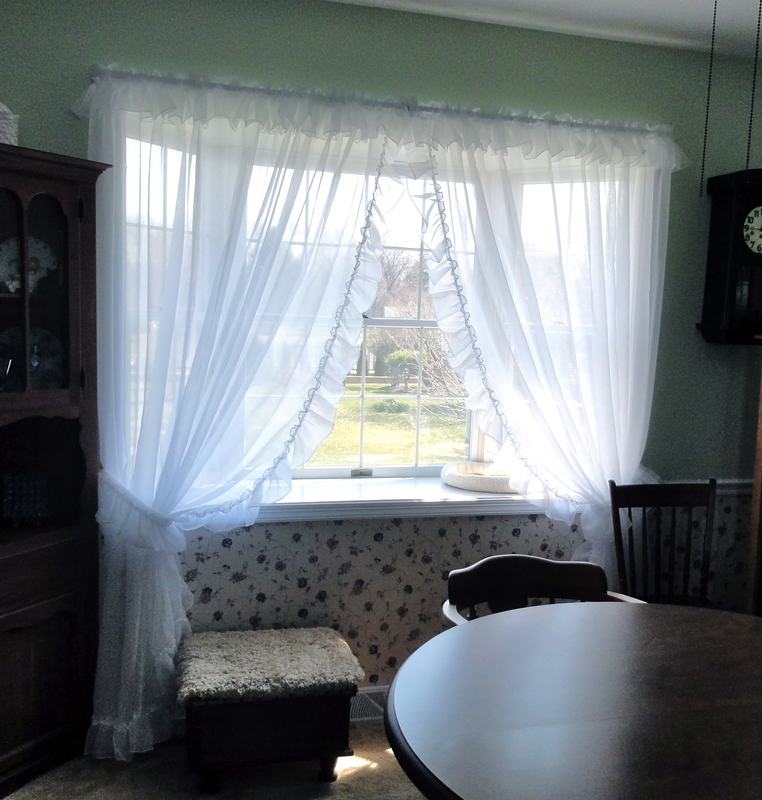 We also moved most of the furniture and other stuff out of the dining room, removed the wallpaper border from the walls, and painted. We also moved the bookcases and some of the other furniture from the living room, and had Stanley Steemer clean the carpets in the bedrooms, dining room, and living room, as well as the stairs and hallway. Almost everything is back in place now, but there are still a few odds and ends to take care of. A lot of work and a fair amount of inconvenience were involved, but, trust me, it was worth it. Our 30-year-old carpeting looks much better now, and nothing brightens up a room quite like fresh paint. We also did some decluttering, and I did some destashing, too. I think that clear plastic storage bins are the greatest invention ever. They are a boon to organizing and storing all the stuff one accumulates in a lifetime that one just cannot yet bear to part with. 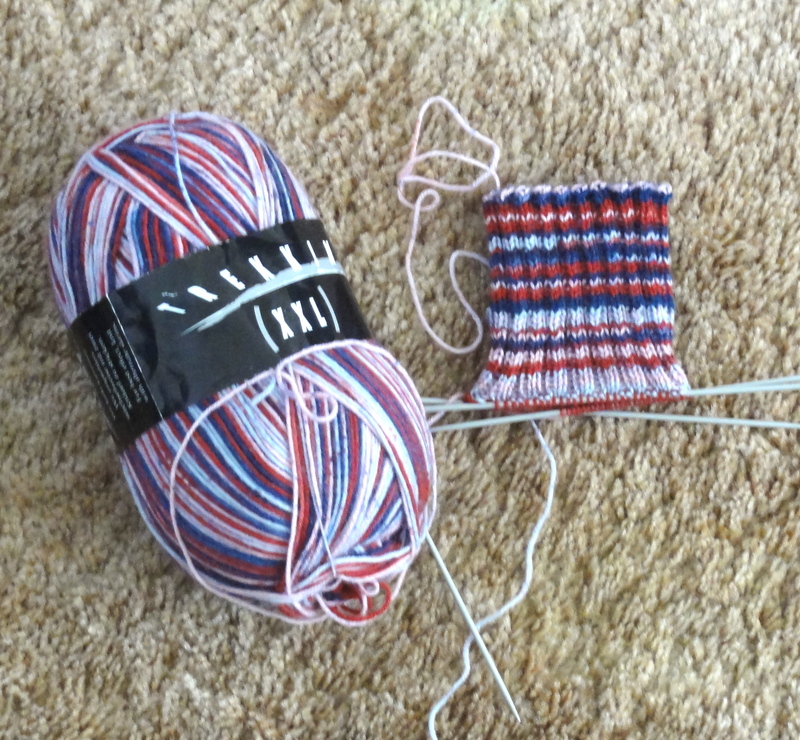 Although all the painting, cleaning, and organizing has kept me busy recently, I have still found time for watching hockey and knitting. I’ll sum it all up with pictures. 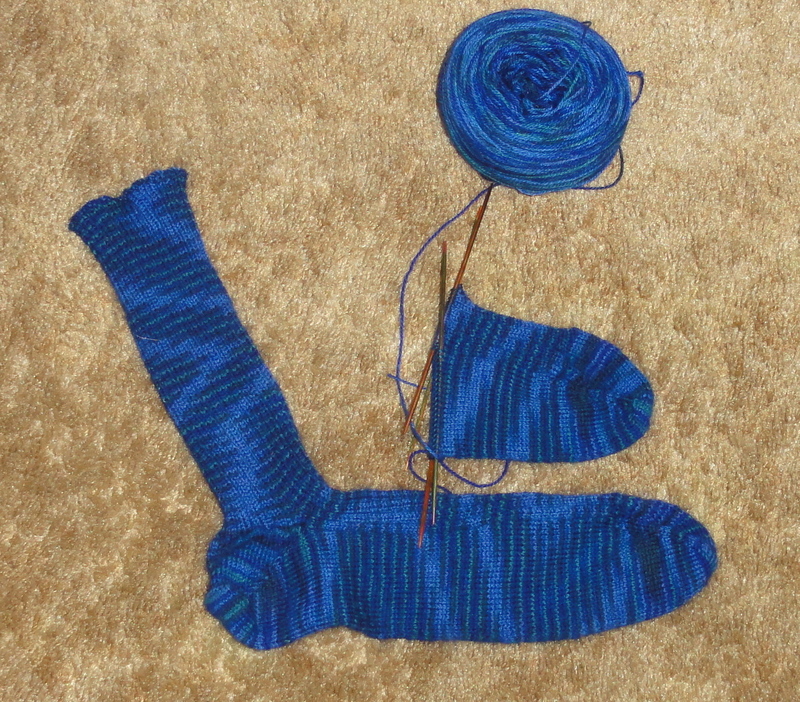 Greg’s second 3 x 2 ribbed sock is well under way. 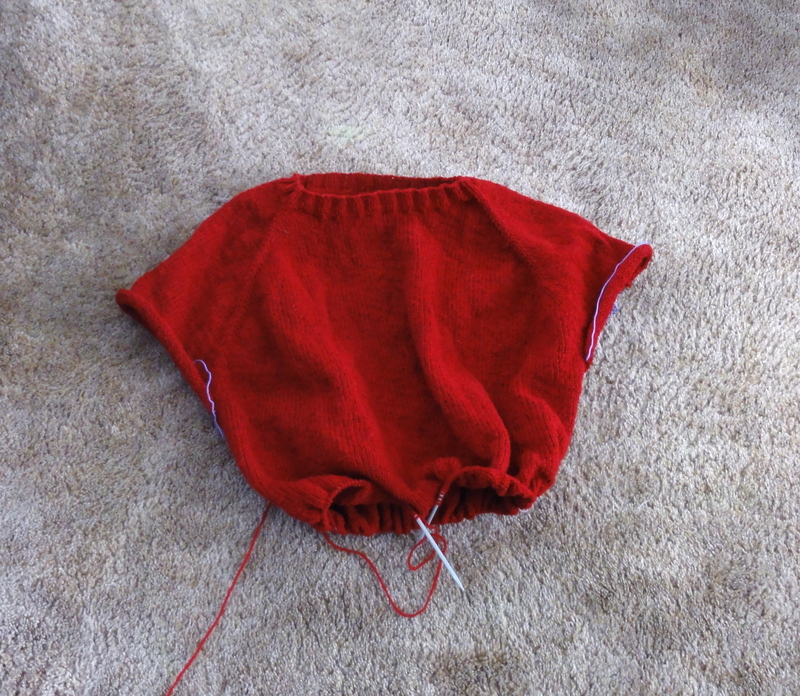 Please check out Tami’s WIP Wednesday. 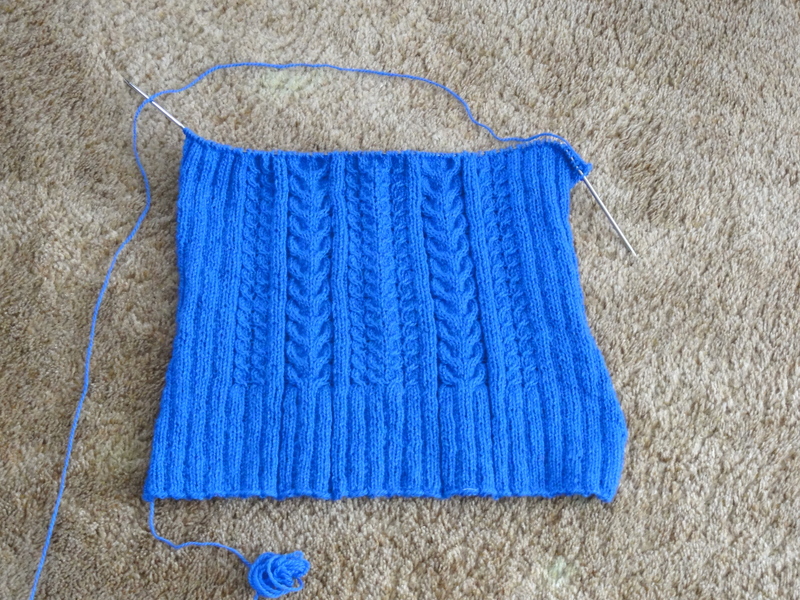 This entry was posted in Knitting, Socks, Sweaters and tagged Cassidy sweater, WIP Wednesday. Bookmark the permalink. I am SO glad that everything is okay with you! I was starting to get worried .. I think the Cassidy looks absolutely stunning, too. Bonne Marie is a wonderful designer and this pattern is very easy but looks very complicated. I like the blue, too. It’s intended recipient will look fabulous in it. You have been busy but at least you still managed some lovely knitting! A simple carpet cleaning can really bring a room back to life so I make sure to have my carpets cleaned every 3-4 years. There’s something about clean carpets that makes me feel comfy at home. With the exception of the dining room, none of the carpets we had cleaned had ever been cleaned beyond routine (sporadic) vacuuming. The results from the professional cleaning far exceeded my expectations. Who knew 30-year-old carpet could look so good?